Late last year we reported on Project NEON – the upcoming UI upgrade for Windows 10. 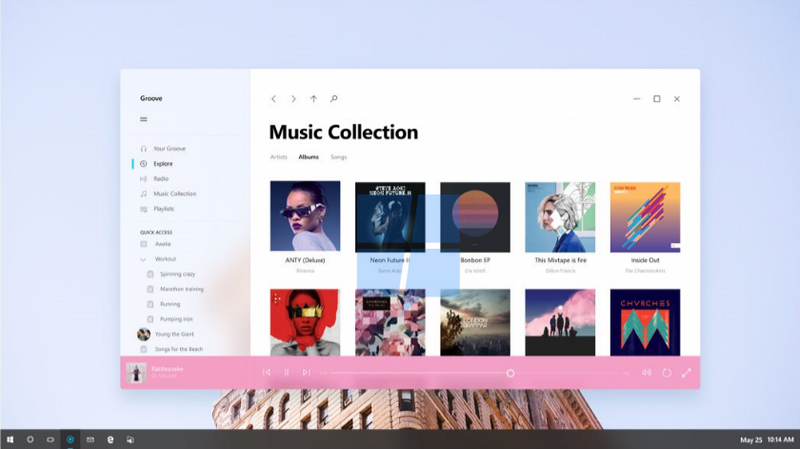 Recently we managed a closer look at Microsoft’s internal plans for Project NEON and the future of Windows 10’s UI (user-interface). Right of the bat I don’t want readers to be fooled by those who suggest this is a major or a complete overhaul of Windows 10’s design language. In fact, it’s a fairly minor update that builds on the current Windows 10 UI (aka MDL2). Nevertheless, change is always exciting, so here’s an early look at NEON. 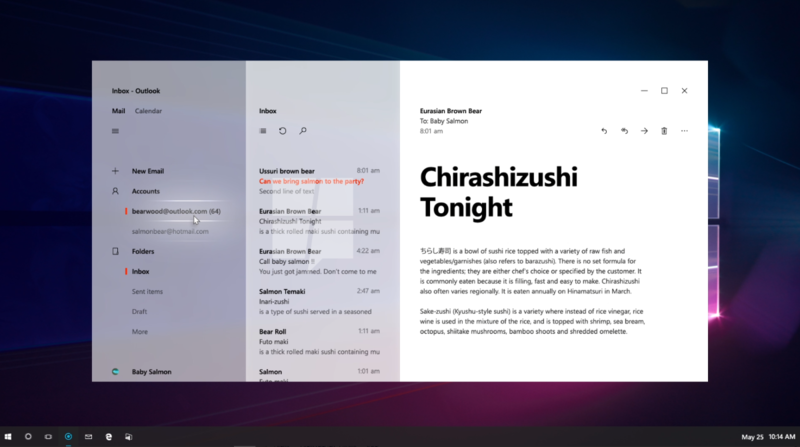 These acrylics work nicely with what Microsoft calls the Conscious UI and Connected Animations. 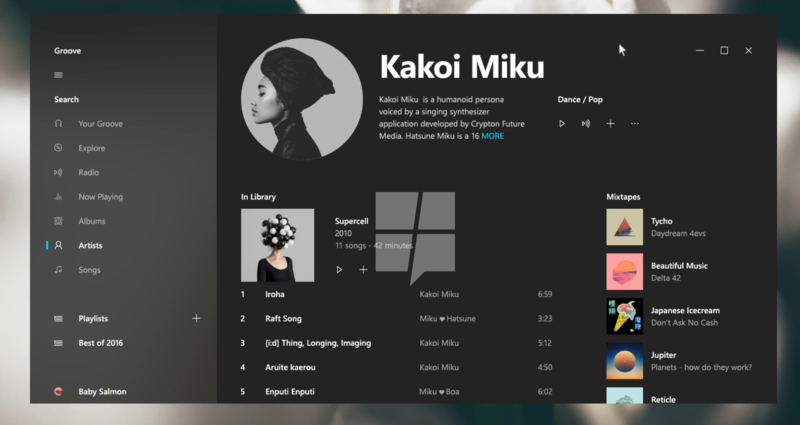 In one of the internal concept videos, Microsoft demoed this Conscious UI in the Groove Music app where the Side-Nav Acrylic changes depending on what’s behind the current app, and the picture of the artist also has a neat little effect where it moves around a bit when the user moves the window. Project NEON also focuses a lot on 3D and HoloLens interactions. As shown in the above concept, hovering over a navigation item or element shows a backdrop to make it feel like a natural interaction. On a PC, the background color will follow your mouse’s pointer – but on a HoloLens, it’ll presumably follow your gaze or HoloLens’ clicker. I have seen a few other video concepts of Project NEON which show off some of the animations in the UI – and to put it simply, these animations are stupendously smooth. Then again, these are just concepts and the “real deal” will likely be a lot different, for better or worse. If you look closely it looks like Microsoft is also tweaking the design of the taskbar – but we doubt Microsoft will actually make these changes when it ships NEON later this year. There are a lot of other neat little things Microsoft is planning internally for NEON as well. However, do keep in mind that these are just early plans and concepts, so the timeline regarding NEON is quite uncertain at this point of development. Microsoft wants to get the foundation laid for NEON with Redstone 3, which should mean we will start seeing NEON on some of Microsoft’s own apps with the Redstone 3 release. As for the third-party, independent developers, they will likely be able to start implementing NEON into their apps as well with Redstone 3 but I was not able to confirm this with multiple sources. Redstone 3 is expected to get released sometime later this year, following the release of Redstone 2 (the “Creators Update”) which is set to be released this April.